My working theory is that the blob is copper that has melted, flowed down onto the quartz liner, cracked it, and then invaded the alumina sponge. At this point it would also have shorted out the PSU. And molten copper is not hot enough to melt Alumina. He has been working on this -on and off for years - he has a day job and I don't think he sees 8 weeks are being a disaster. And neither should anybody else. In the meantime LION has shared enough information during the course of six hours of fascinating face-to-face discussion to make independent replication possible. That is very nice of Lion to be so open. Without revealing any IP you may have gleaned from your 6 hour dinner; how did he get so far ahead of the pack? Is it because of his fuel, fuel preparation, power application, technique, or all the above? He is welcomed to comment or answer, but I get the impression he is a bit shy. I can probably test a bit of copper on hot alumina sponge and see what it does fairly easily. Might not have time to do it for a several days. The sort of alumina sponge makes a difference I suppose. Without revealing any IP you may have gleaned from your 6 hour dinner; how did he get so far ahead of the pack? Is it because of his fuel, fuel preparation, power application, technique, or all the above? He is shy. The answer is that he is very bright, very focused, an 'out of the box' thinker, a good craftsman, and has been working on this for many years. He was my first reactor client btw. Small variation, instead of dropping hot pads into D20, I added D20 to a porcelain crucible holding them as soon as it came out of the oven for maximum thermal shock. I was confused about this comment, I think dropping hot diamond pads into D2O would cool them much faster than pouring D2O into a hot crucible. No? I would agree if it wasn't for the fact that to get them into a 5ml container full of D2O you would have to coax them out of the crucible and slide them all the way down a cold glass funnel into the water. At this point it would also have shorted out the PSU. But wasn't there a problem of some sort with the system? I thought this is why we don't have a temperature record. I could be misremembering. Bob Greenyer says that the copper windings from the region of the reactor where the blob is have disappeared. So the copper must have gone somewhere and I think it likely that it melted and went downwards. If it broke through the quartz sleeve and invaded the region of the Kanthal wire, what would be the consequence for the controller system? And molten copper is not hot enough to melt Alumina. Good point. I suppose that the whole point of using alumina foam is that it is refractory and does not soften? Alan, were you able to obtain from LION more information about his account of powering an LED light bulb with the reactor? What was the current path through the reactor? Was it from fuel tube plug bolt to earth ground or some other current path? Was a capacitor or super capacitor in the circuit? Well, we spent 6 hours discussing the experimental protocol- but never got that far. I am pretty sure however that it went from the bolt to ground via the bulb and a supercap.
" I suppose that the whole point of using alumina foam is that it is refractory and does not soften? Not till you get to 2000C+ These are 'class 26 furnace-face blocks' - made to withstand direct hest from a gas flame. 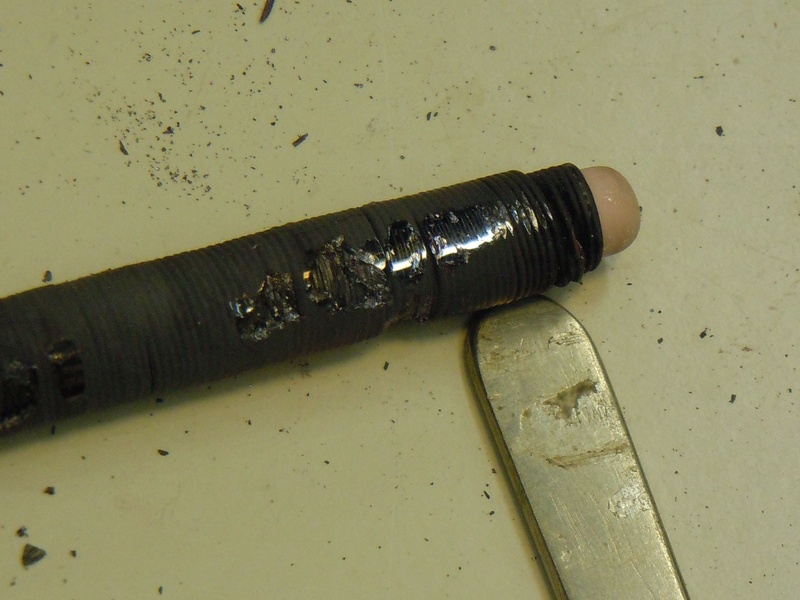 ... it seems to me that some sort of metal has flowed from the region of the alumina tube at the core of the generator through the damaged quartz sleeve and into the region of the Kanthal heating wires (on the left in the photo). Since most of the copper wire has disappeared from around the core, much of this flow is probably copper. At some point in the life of LION 2, therefore, the heating wires became electrically and thermally continuous with a pool of molten copper. I suggest that this might have affected the behaviour of the controller. The controller is sensing temperature in the core but delivering current to the pooled metal which could thereby become even hotter. Did you ever try obsidian the same way? This is a worthy idea. But since the PID was said to be set at 850C max (from memory) this is way below the melting point of copper, and the PID would thus be delivering zero current since the thermocouples would be saying ' too hot, no more!'. Further to this, any increase in current sufficient to create some kind of molten/vapour copper hot spot would trip the PWM or the PSU, both of which are fitted with short-circuit protection and a max current of 11A at 36V. So while I am very happy to agree that there should be a banal explanation for the system's apparently anomalous behaviour, it isn't one that involves the delivery of lots of localised electrical energy from the PSU. Seiber Troutman - Never yet! I wish you would. See my comment above about the type of Alumina btw - Class 26 furnace face bricks. I think I have some already, although I'm not certain that they are the same. I'll check. I was just moments ago eyeing up my pair of Q-X type horizontal clamps, and considering attaching my incredibly dangerous Tesla coil to them. It's been about 20 years since I stuffed that coil system in a box, immediately after it nearly killed me. I bet it can easily fire a continuous spark across the width of the Q-X. Good, don't forget the 1 Ohm resistor! Building another kind of control today, a 'witches cauldron' containing all the non-diamond ingredients of the reactor mixed together in a quartz outer rube - which will be exposed to very high heat for 48 hours as before. I hope that this will help in clarifying the difference between purely thermal anomalies and presumed LENR-related anomalies in the LION system. More on this as I assemble it. Bob Greenyer's survey of the remains of the quartz liner from the LION 2 reactor reveals colour changes that extend throughout the body of the quartz. What is the nature of the colour changes I see in liner from the 1000C control run you performed? Is the colouring coming from surface deposition of copper silver etc or is there colouring throughout the quartz? Hi Bruce. The colouring I see is from 2 sources, Carbon traces, and what might be condensed Cu vapour, though in that case I cannot understand why it isn't oxidised like everything else. These are both surface discolouration only. Today we kicked off the third control experiment for LION. The purpose of this experiment is to see what happens when all the various ingredients available to the lion system are mixed together and baked for 48 hours, in order to better determine what might be purely thermal effects, and which are LENR related. Making some Alumina brick dust. Below:- K26 brick dust, magnesium oxide, copper wire fragments, a small fragment of fuel tube with 2 diamonds, zinc plated steel bolts and Cu wrapping, broken quartz, silver leaf, kanthal wire, ready to get mixed and baked. The quartz tube -plugged one end with Alumina cement, ready for loading with mixed ingredients. Close to the 800C target.